Gore Verbinski, Ted Elliot and Terry Rossio returned to craft the story and screenplay, and while the idea of doing a new story featuring the same characters ala Indiana Jones was discussed, it was decided to craft an intricate trilogy, playing on themes set up in Curse of the Black Pearl. The first film was to be titled Dead Man’s Chest, a title with two meanings, first being the film’s macguffin, a chest with a secret, the other being an old pirate song. Back were all the characters, such as Will Turner, Elizabeth Swan, James Norrington, former Barbossa sidekicks Pintell and Raghetti, and of course, Captain Jack Sparrow. 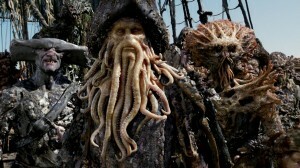 Instead of mining either the rides for a new villain (I recall talk of making Bluebeard, the pirate of the main ship in the attraction before Barbossa replaced him) they instead mined the depths of pirate lore, and came up with one solution, the pirate all pirates fear, Davy Jones. Creating him would be a technical marvel akin to the birth of the animatronics used in the ride. Casting British thespian Bill Nighy to provide the voice, they also used him to provide the motions for the character, having him on set in a grey suit with markers all over, providing the animators with the basic essential rigging for their computer generated monster of a captain. His crew was created much the same way, although most wore makeup creations as opposed to dots. Best not to mention Sushi around him. Filming took place starting in 2005, going from Palos Verdes, St. Vincent, and the Bahamas, as well as at Walt Disney Studios and Universal Studios in Hollywood. Filming would continue well into 2006, even as post production began on the first film in the new set of sequels. 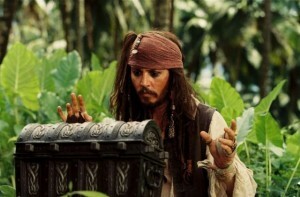 Dead Man’s Chest was eventually released in July of 2006, following a lavish premiere at Disneyland like it’s predecessor. The film was a smash hit, becoming Disney’s biggest success, and their highest grossing movie until the release of their co-production of last summer’s Avengers. The film starts off really rough, struggling to get a good footing, even after some lovely introductions for the main characters. It spends far too long on a subplot featuring cannibals who worship (and therefore wish to eat) Jack, which leads to some fun jokes, but little else. It’s only tie into the the overall plot of the film is Jack’s motivation for going to the island is to get off the sea. In my opinion, it could have been better served as the intro to Captain Jack, with no explanation of why he went there or got trapped, and simply have him escape the island as his big welcome back. Instead it’s a bloated hour of film running time. Once they get off the island and consult the voodoo priestess Tia Dalma, the film picks up and almost matches the first film in terms of sheer fun. It’s flawed, but the good parts are good, and there is plenty to like about this adventurous summer blockbuster. Scenes with the Kraken are breathtaking in scale and scope, and bring a realistic modern twist to the Harryhausen tricks of old. In celebration of the film’s release, Walt Disney Imagineering decided to spruce up the ride for the July premiere, and in turn add some characters from the film franchise. 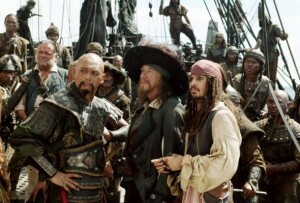 Jack Sparrow is littered through out the ride in key scenes, while Barabossa takes over for Bluebeard as captain of the Wicked Wench pirate ship. Davy Jones makes an appearance in a new show piece, a waterfall made of mist where he warns guests of what lies ahead. The ride additions were hailed by most as a great use of the characters that doesn’t detract from the classic structure of the original ride. The additions were added at both American parks and eventually Tokyo. Paris is currently the only version of the ride that has yet to add any reference to the films. This is how they paid Johnny for the movies. Chow Yun Fat, Geoffrey Rush, and some dude in drag. I only saw Dead Man’s Chest twice in theaters, but I saw World’s End quite a few times, basking in the joy of a filmmaker unburdened by budget or studio concerns. The film just oozes fun, and it restored my faith after the shaky second film. In Disneyland, they decided to do one more major Pirates update to celebrate the release of the third film. They transformed their Tom Sawyer’s Island walk through attraction into Pirate’s Lair, where guests journey through a mixture of pirate and frontier styled walkways, and encounter props and characters from the Pirates films. 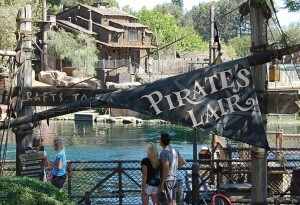 Yes, when I think Frontierland, I think Pirates. Years passed and Disney decided they wanted more of that Pirates booty, so they set out to make another film, this time without Gore Verbinski or many of the original cast members. Buying the rights to a novel about Blackbeard and the fountain of youth called On Stranger Tides, Ted and Elliot set to adapting it to the world of their Pirates films, turning the books main character (called Jack) into Jack Sparrow. Jack takes center stage in the film, which was produced on a lower budget than the sequels, putting it more in line with the original film. Sadly, it doesn’t even come close to capturing the spirit of the original, and seems like Jack Sparrow going through the motions. There is a brief spark of fun in the film, but it’s so muddied down by poor storytelling choices and wasteful uses of good actors that it’s hardly noticeable. The use of mermaids is chilling, but that scene comes and goes far to quickly for it to have any real impact on the audience. They even manage to turn one of histories real pirate monsters, Blackbeard, into a boring character that pales in comparison to the fictional villains who came before. Edward Teach is a true scally-wag, as they might say, and yet, here he is a doting father who practices voodoo, and occasionally sets a dude on fire. The film made lots of money, however, and a new Pirates film is again on the horizon, with the script being written right now. It seems as if Ted and Elliot are off the franchise now, which might mean we get a bit of fresh air, or we may just get more of the same in a lame imitation of what’s come before. I’ll be seeing it, simply because the character of Jack Sparrow entertains me far too much to miss out on what could potentially be another good use of him. We shall have to see. 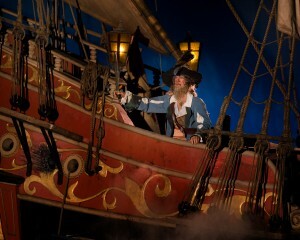 The ride has had some small changes in response to On Stranger Tides, now you may also see Blackbeard in the misty waterfall along with Davy Jones. This makes little sense, but hey, cross-promotion! Recently a scene involving some pretty creepy mermaids was added as well, using some sophisticated water projection technology to make it seem as if your boat is surrounded by the deadly fish-ladies. Overall though the ride remains the same story that has been their since it’s inception. Pirates of the Caribbean remains a classic to all who visit the Disney parks, and it’s legacy has grown exponentially with the introduction of the films. 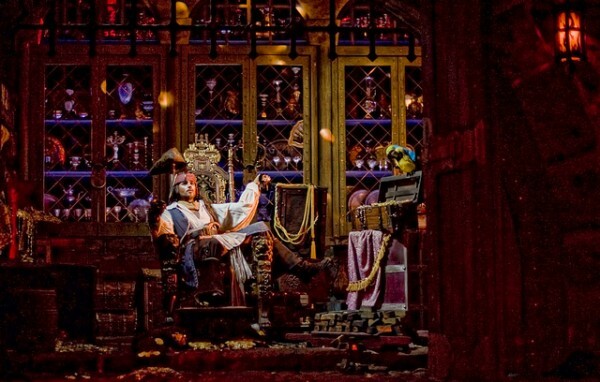 Disney World has even built a SECOND Pirates themed attraction, located at their Hollywood Studios park, where guests join an interactive show with Jack Sparrow (portrayed by a hologram of Johnny Depp acting drunk) and see if they have what it takes to join the crew. The glorified exhibit also features props and costumes from the film franchise on display as you exit. While not the same thrill as the ride, it’s interesting to see how pervasive this concept has become. Will new changes be made to the ride. It’s possible. Shanghai is working on their version which seems to be a completely different ride than the rest of the world, so maybe it will inspire the other parks to follow suit. For Disney, both as a film studio and theme park giant, there is no end in sight for the pirates life. Yo Ho. And stuff.